This eight week course will deal with the physical care and preservation of your museum collections. 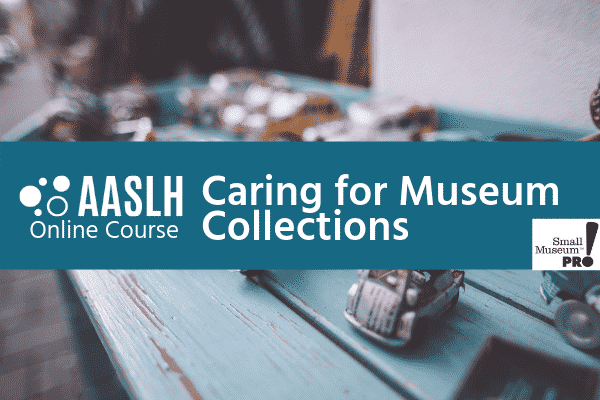 This practical course will cover how collections age and deteriorate, handling collections, storage requirements, environmental considerations, housekeeping, and risk management. Know how to perform a risk assessment of your museum and use it to write a disaster plan. In 2014, Rebecca founded Rebecca Elder Cultural Heritage Preservation to provide preservation advice to clients holding history collections. Rebecca has also worked at Amigos Library Services, the Harvard University Libraries and the Dolph Briscoe Center for American History. Rebecca received her MSIS and a Certificate of Advanced Studies for Conservation of Library and Archival Materials from the School of Information at the University of Texas at Austin, and now is adjunct faculty at the iSchool, teaching Preservation Management and Treatment Techniques for Bound Materials. She also serves as coordinator for the National Heritage Responders, a team of volunteer conservators and allied professionals who respond to disasters. Rebecca is a Professional Associate member of the American Institute for Conservation of Historic and Artistic Works. She also engages in professional service with the American Institute for Conservation, the Society of American Archivists, the Society of Southwest Archivists, and the Association of Tribal Archives, Libraries and Museums. Rebecca lives in Austin, TX with her four cats: Frankie, Princess Snowball, Thingy and Tucker the Most Interesting Cat In The World (@heytuckercat on Instagram). She knits obsessively, collects smashed pennies, and isn’t afraid to admit that she loves 1970s white polyester jumpsuit Elvis. Looking to connect? Head to www.elderpreservation.com. She’ll be glad you did.